Things in Eden turn a little stranger than usual for Mark in the wake of deadly home invasions. 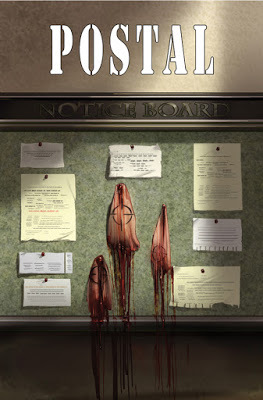 The second arc of Postal takes a detour from the regular narrative but doesn't skimp on the tension or suspense. Despite some concerns in this issue, the team of Matt Hawkins, Bryan Hill, Isaac Goodhart and Betsy Gonia have created a compelling and eerie crime drama worth reading every month. What makes Postal stand out is the central character of Mark. Always underestimated and bullied, his Asperger syndrome seen as a disability, Mark is really the smartest and most honest person in Eden. A town made up of unscrupulous citizens looking to hide from their pasts. The first arc touched on the many quirks and nuances of the town including Mark's own mayoral mom who's a monster to him and the legacy left behind his mysterious father. If you thought Twin Peaks had its dirty little secrets you haven't read Postal yet. With other storylines on the back burner for issue five, like Mark's friendship with local waitress Maggie, Mark finds himself in a heap of trouble after leaving the mail depot, meets a pretty girl and soon becomes the hostage of a crazy chatty cult figure. It becomes a tense situation but reveals a side of Mark we hadn't seen before. This is where things get too familiar storywise and the bad guys talk a lot but remain one-dimensional. It's a surprising turn as Hawkins/Hill have kept the series fresh and interesting thus far. That's not too say issue five isn't a compelling read despite its simple premise. There's built-in anxiety throughout the scene with Goodhart's clean pencil work and measured layouts. It has a slow-burn effect visually that heightens the tension. Gonia's perfectly tailored colors and shadows give the issue the proper eerie glow. These new events could mean something greater going forward, but it all moves quickly, perhaps too quickly, to make a bigger impact. It felt like a one-shot storyline and Mark seemed a little out of character as well. The series has been great so even when it's off a little Postal is better than most books.